Where Have You Been, Woman???? Yeah, I know. I’ve been scarce. I am liking the Instagram connections with the blog, but I get that it isn’t saying much. My last “normal” post was on January 5th, about my Instant Pot that I got for Christmas. But let’s now play a little catch up. This post will be full of photos and YouTube videos, so bear with us. 1.) Dave’s brain surgery was mostly successful, but he developed a condition known as temporomandibular joint disorder, or TMJ/TMD, possibly as a consequence of the microvascular decompression procedure last November. Dave’s still in the middle of getting a complete diagnosis and treatment plan, but at least the TN pain is significantly reduced (it returns under certain conditions, such as stress, cold weather, and a direct impact to the face). Dave’s been enjoying being off the drugs that made him pretty slow last fall. He had a great spring semester teaching, and this week he’ll be marching with the faculty at the AF Academy graduation. 2.) We bought a new house in February and moved in April. To many this might have seemed like a quick, spontaneous development, but really it wasn’t. You have to go all the way back to when we elected to “choice” Jacob into a non-neighborhood middle school in 2014. We always had in the back of our heads that we would want to live within the part of town that officially fed into that school. But before we could make that commitment, we had to make sure the Air Force wasn’t going to move us anymore. We found that out in February…and within the week, we had a contract on a new house! 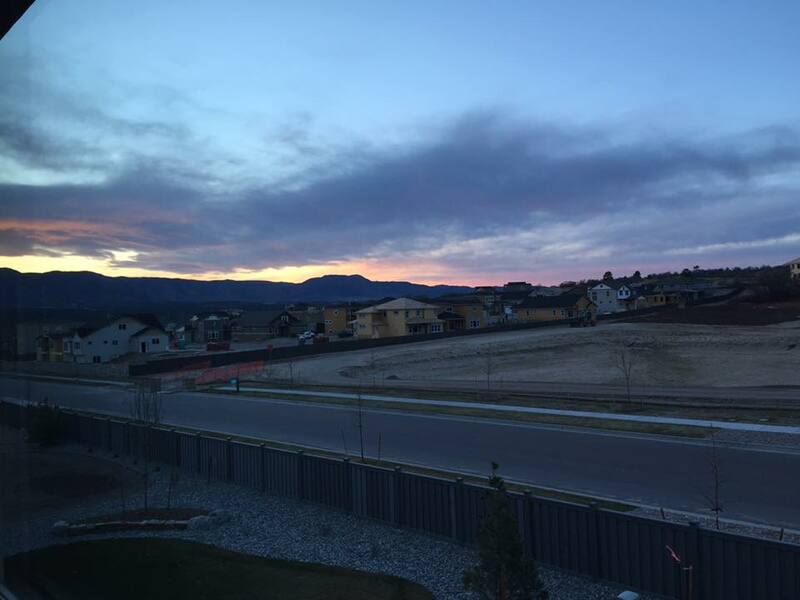 We fell in love with a neighborhood in the northern part of Colorado Springs called “The Farm“, a planned community being built on the former Allison Valley Farm directly across I-25 from the Air Force Academy. We were able to get a “spec house” (“spec” being short for “speculative”), meaning it was already built and finished. 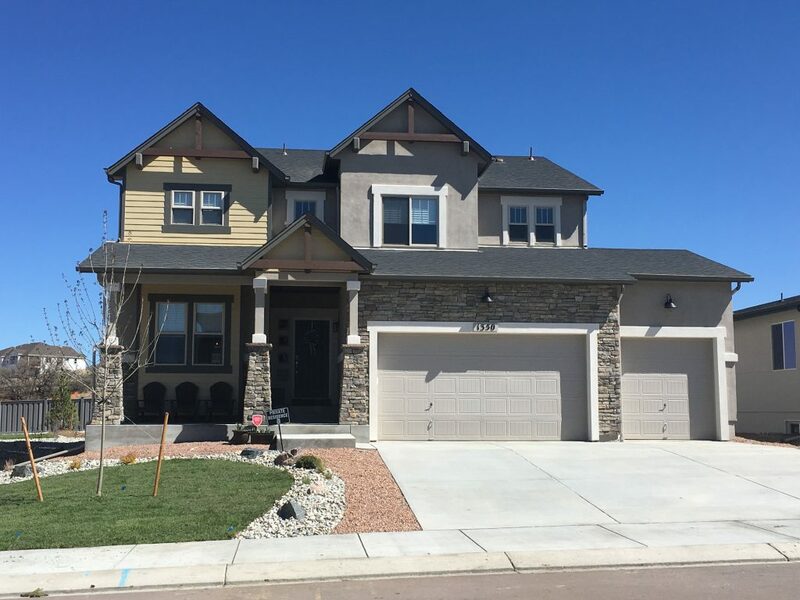 On our street, the vast majority of houses are custom builds, so we made the not-so-straightforward decision to take the “spec house” so we could get in on the first completed street in the neighborhood. We are thrilled and excited to get to be in somewhat of a “forever” house: we expect to be here at least until the boys finish high school. I’ll explain more about the house in the photo captions. 3.) I am returning to active duty in June. I received an offer to get activated for three years with the Air Force Academy faculty, teaching geosciences courses (at least for now). All this time I had been teaching, they were on one-semester-at-a-time activations, so it will be nice to not have to worry when my next work would come in. I haven’t been working since Dave’s MVD surgery at Thanksgiving, which has helped to make our move happen more smoothly. 4.) The boys are wrapping up 8th (Jacob) and 6th (Timothy) grades this week. They each did very well, grade-wise. Jacob’s registered for his high school classes, which opens up a new world of electives. I was tickled that he’s going to try out anatomy and physiology and debate classes this year. This past month was quite the whirlwind, where on top of our moving, the boys had numerous end-of-the-year events: music concerts and recitals, field trips, and Boy Scout activities. Here are some photos of the new house, enjoy! We waited until we had grass on the lawn before we shared the photos publicly. That wasn’t until May 5th. Each house on this street is very unique…the one to the right of our house is mid-century modern. 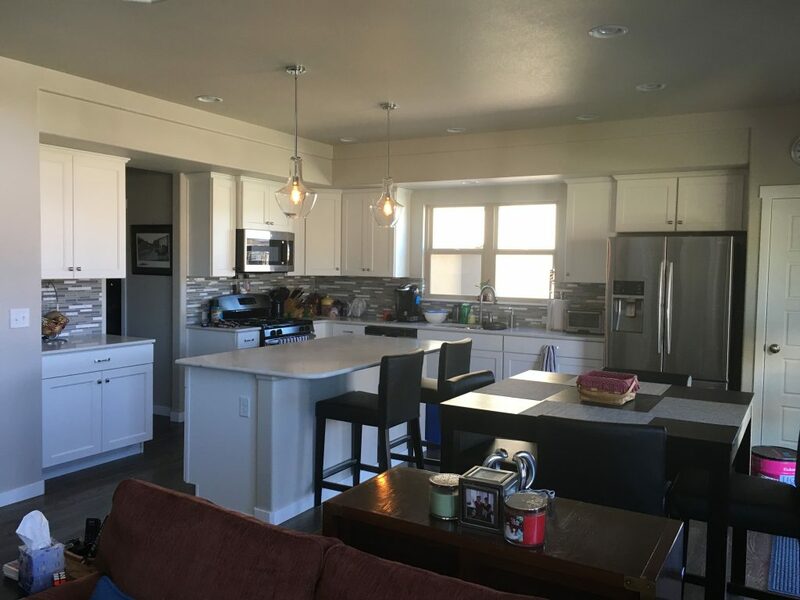 Here’s what sold me — this amazing kitchen! In the 9-10 houses I’ve lived in since 1995, this is by far the biggest one! The house included a gas stove, and higher quality appliances. This particular house is based on a floor plan with the option to give up the formal living room and convert that space into a walk-in pantry. It’s huge and I’m thrilled to not have to spread my kitchen appliances between my pantry, garage, and basement anymore. 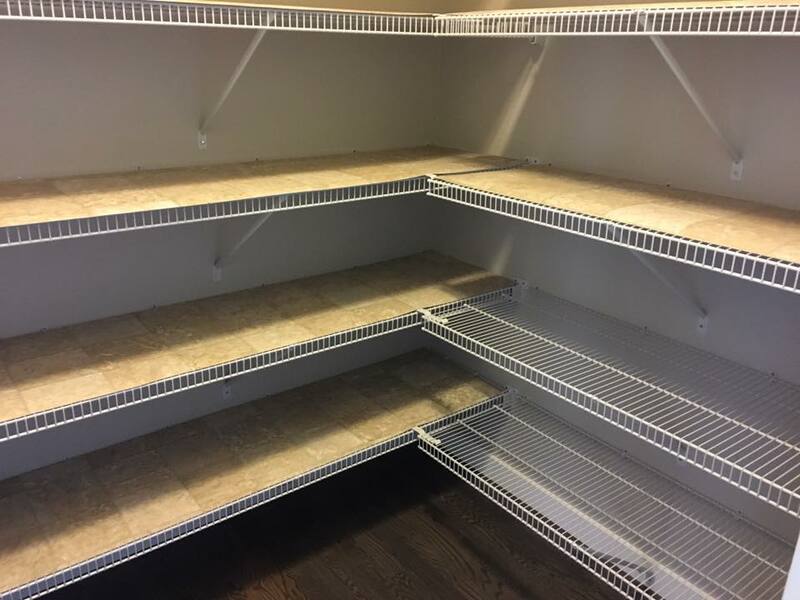 This was just before we moved in — I bought a length of vinyl flooring and cut it such that I could line these wire shelves. 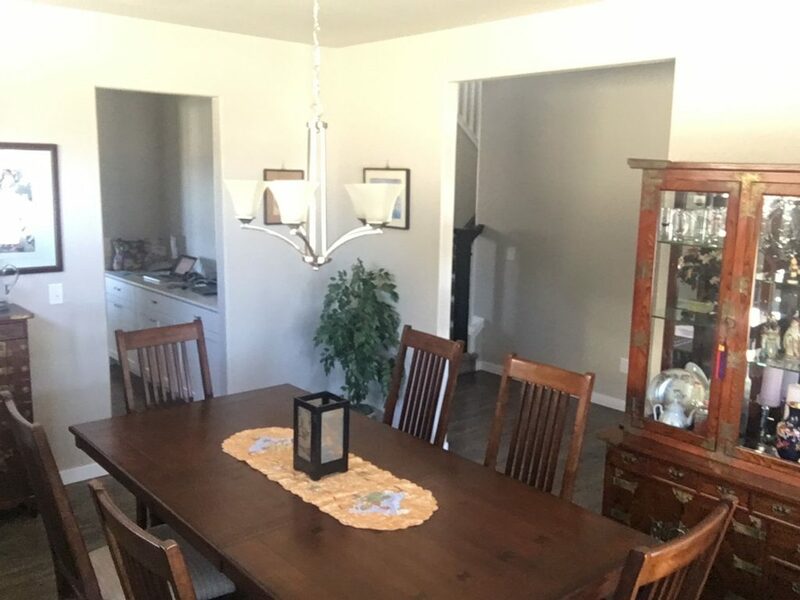 We do still have a formal dining room, which fit our existing dining room furniture nicely. 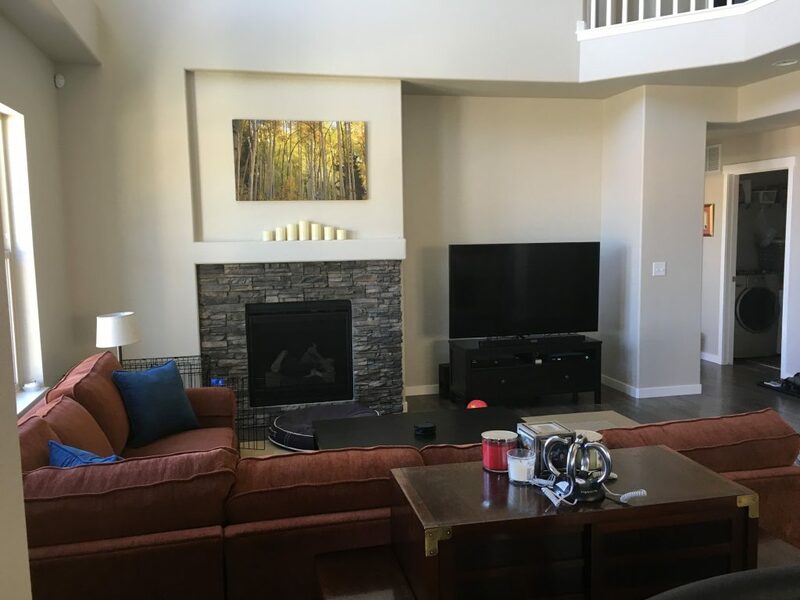 The family room. This house has LAN outlets throughout so we are able to hardwire our entertainment items for Netflix streaming instead of relying on WiFi like we have in previous homes. Master bedroom. 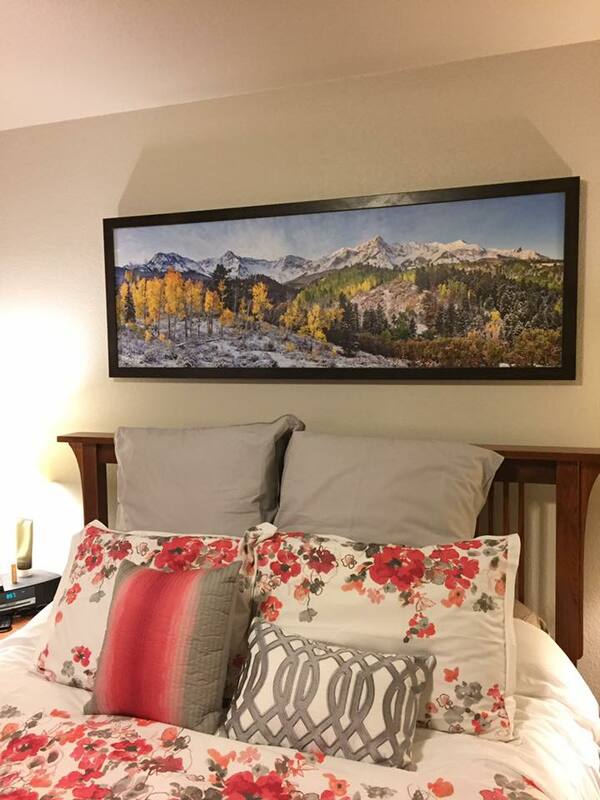 I’m showing off this panoramic photograph Dave and I picked out last night. It’s taken near Ridgeway, Colorado, a town we visited in 2014. Perhaps you’re wondering how the views are? They’re very nice from our house. We didn’t have direct views from the previous house, and in this case, we’re exchanging one kind of indirect view for another. 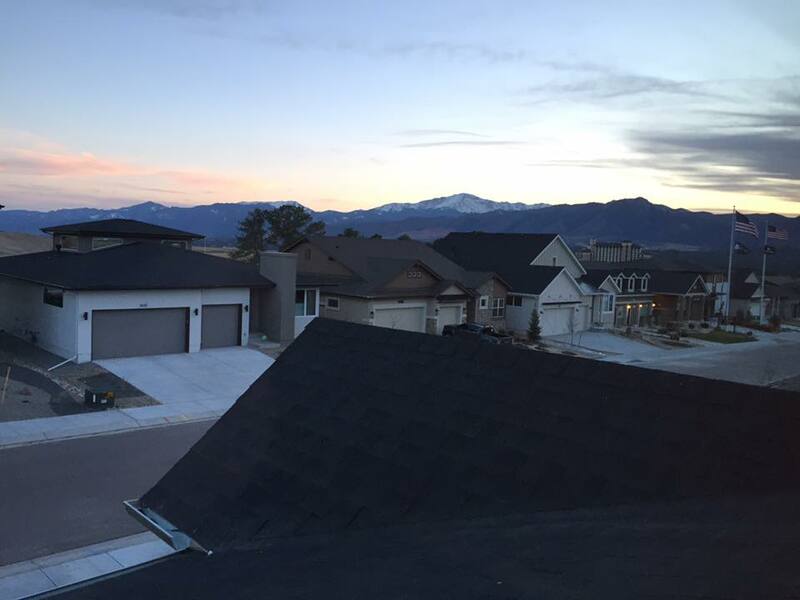 The boys’ rooms — at the front of the house — have the Pikes Peak view, and this is what Timmy sees as soon as he opens his eyes in the morning. You can enjoy this view with us from our weather webcam, which is perched in this particular window. You can also get an idea of the unique variety of architecture styles on our street. This is the view from the back windows of the house, including from the master bedroom. The highest mountain peak you see there is called Mount Herman, and overlooks the town of Monument. You can see that there’s a street that runs right behind our house. The vacant lot across that road is earmarked for an elementary school, although there’s nothing in writing to secure it…which makes me nervous. Finally, I leave you with some YouTube videos of the boys’ musical performances this past month. I’m going to start with discussing Timmy. Midway through the school year, Timmy asked if he could start cello in the school orchestra. I told Timmy he had to go visit the school orchestra director, Mr. Mathews, and ask him directly. Mr. Mathews said that if Timmy was willing to do private lessons, at least through the end of the school year, then he would allow Timmy to register for orchestra mid-year. So that’s what we did — Timmy got a list of local teachers, and we found a teacher just a few minutes north of us. She mainly teaches violin, but also can teach beginner cello. Since Timmy walked in with several years of piano (and one year of guitar) under his belt, reading bass clef music, rhythm, tempo, and dynamics wasn’t hard…it was mainly understand the mechanics of cello. Timmy absolutely loves cello and for the first time EVER, we don’t have to nag him to practice. Even though he only was required to take the lessons for the first half of 2017, he asked if he could continue AND take part in a week-long orchestra camp in July. He quickly caught up to his peers in the school orchestra, and here is his cello recital solo — this was after FOUR MONTHS of lessons! The very next day was his school orchestra spring concert, here is a piece they performed called “Enter the Heroes”. Unfortunately, you can’t see Timmy among the sea of cellos and basses — he’s sitting directly left of the left-most string bass. Jacob just wrapped up his 8th year of piano. Unfortunately, the teacher he’s had these past 4 years just retired, so we have to figure out a way-ahead for his continued piano lessons starting this fall. Jacob also just finished his 3rd year of cello. He intends to continue at least one more year in the high school orchestra, but when asked which he’d rather continue with through high school, without a second thought: piano. Wish us luck on our search. Here is a video from his piano recital in April. This was a very difficult piece for him, and he nailed it in February in a piano festival, where he received a “Superior” rating. And finally, a video of the middle school 8th grade orchestra playing an adaptation of “Pirates of the Caribbean.” Like Timmy, Jacob was difficult to see in the video. He’s further back, also just left of the string bass…I tried to zoom in on him.